A team of scientists from MSU and their foreign colleagues have discovered a previously unknown species and genus of batrachians Siamophryne troglodytes. These frogs live in the only one place on Earth—a limestone cave in Thailand. The location of the cave is undisclosed to protect the animals. The results of the study will lead to the reconsideration of the evolutionary history of these amphibia and are valuable for systematics and conservation. The results have been published in the open-access PeerJ. Studies over the last two decades have illuminated the diversity of frogs, snakes and lizards, and in particular, the richness of herpetofauna in South and Southeast Asia. Many species of these animals are difficult to find, and some of them are often almost impossible to differentiate from each other. The recent progress in molecular and genetic methods in taxonomy allows the scientists to discover new species every year—this has become a sort of routine. However, the discovery of a new genus is rare and unexpected. The wonderful story of the discovery of Siamophryne troglodytes began in 2016, when a Thai researcher, Jitthep Tunprasert, was working in a karstic region of Sai Yok District in western Thailand. In one of the caves, he found a small, strange frog with big eyes and fingertips enlarged to wide disks. He took a picture of the frog and shared it with his colleagues. It became clear that this species of amphibia was absolutely new and unknown to the scientific world. Judging by many morphological characteristics, the frog was included into a large and diverse family of Microhylidae. However, it was unclear which group within the family it fell into. "Thai colleagues contacted me because I'm interested in this family of amphibia. Together, we conducted extensive work, collected specimens, analyzed the DNA and morphology of both adult animals and tadpoles," says biologist Nikolay Poyarkov at MSU. An international team of scientists including herpetologists from MSU took several trips to the cave. Phylogenetic analysis showed that the frogs belong to the subfamily Asterophryinae, the representatives of which live mainly on Northern Australia and Papua New Guinea. These results allowed the scientists to reconsider the story of the origin of this group. 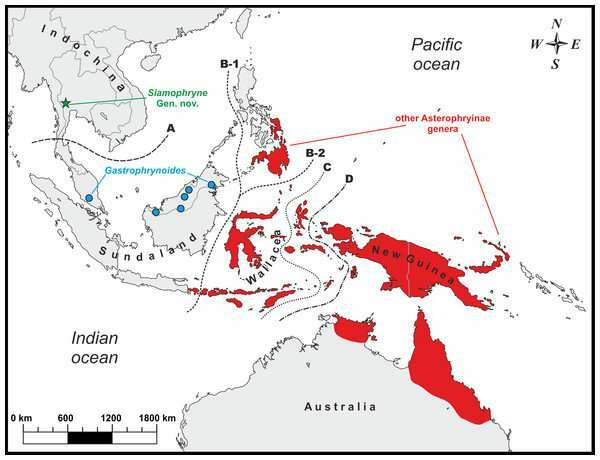 The fact that the close relatives of Australian and Papua New Guinean frogs were found deep on the Asian continent confirms that their ancestors moved to Asia from the ancient continent of Gondwana and then subsequently moved further east to New Guinea and Australia. Therefore, they did not come to Australia via Antarctica, as it was previously believed. Several other species of amphibians and reptiles took the same route. 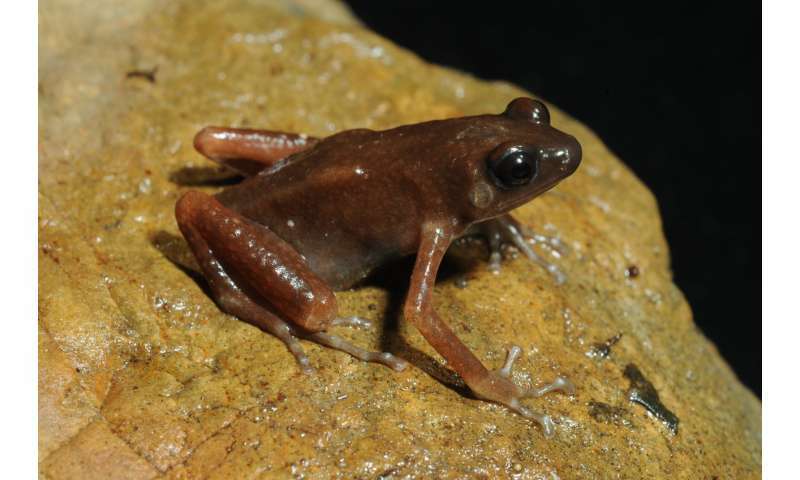 Based on the results of phylogenetic analysis, the scientists described a new species and genus of frogs. The specific name "troglodytes" is of Greek origin and is translated as "cave-dweller." The genus name "Siamophryne" can be translated as "Siamese toad," reflecting biological, taxonomic, and geographical peculiarities of this animal. Skeletal structures of the species were studied using X-ray computed microtomography. Interestingly, all members of the subfamily Asterophryinae known to date develop directly from the egg via so-called "direct development," with no larval stage. Young Siamophryne troglodytes have flat, white guitar-shaped bodies and were found in limestone crevices filled with water. This fact confirms that the frogs did not get into the caves by chance, but live and procreate there permanently. "The importance of our discovery is manifold. First of all, we've found an animal so different from all others that it is considered to be a separate genus. Things like that do not happen every day. Secondly, the phylogenetic position of the new genus sheds light on the evolutionary history of a respective subfamily of microhylids. Finally, this discovery is important in scope of protection and conservation of Southeast Asian herpetofauna. Today we know about only one population of these frogs, and all our search attempts, however intensive, were not successful. Therefore, to protect the animals, we do not disclose the location of the cave," says Nikolay Poyarkov.